Enter Michael Rosen’s book… a resource I wish existed several years ago when I was studying for the Certified Fundraising Executive (CFRE) exam. At the time, Planned Giving Simplified: The Gift, The Giver, and the Gift Planner (AFP/Wiley Fund Development Series) was among the best book on the market (it’s still a great survey on the topic). 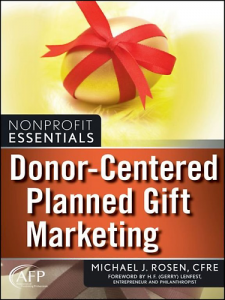 Donor-Centered Planned Gift Marketing: (AFP Fund Development Series) picks up where Robert Sharpe’s book leaves off, but brushes off the perceived complexity of planned giving and challenged my stereotype of the topic. I’ve found it to be a welcomed resource on my bookshelf and I’m sure you will as well. If you’re a donor considering Rosen’s book to help inform your own philanthropy I would also like to recommend an essay on endowments located in volume five of ESSAYS ON ECONOMICS AND SOCIETY 2 VOL SET (4 & 5) (Collected Works of John Stuart Mill). I believe you’ll find this will challenge your perspective on perpetual gifts. Conversely, I would also like to recommend the chapter titled “The Best Fields for Philanthropy” found in Andrew Carnegie’s The Gospel of Wealth Essays and Other Writings (Penguin Classics).